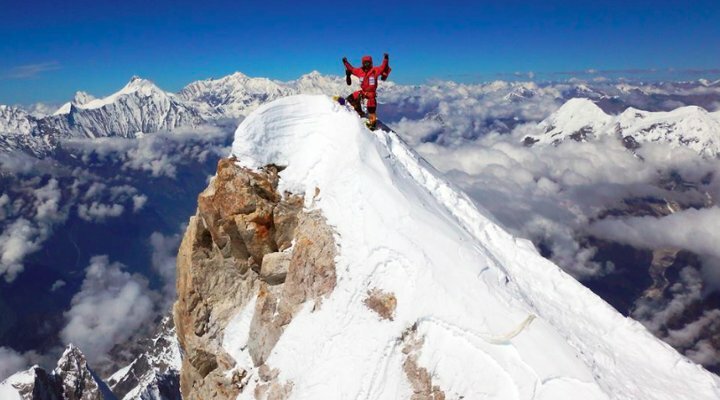 There was another big controversy on 8163m Manaslu, the eighth highest mountain in the world, this year. 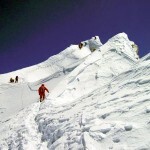 It was widely reported that record numbers reached the summit during a two-day weather window on 30 September and 1 October, with around 100 reaching the top on the first day, and a further 50 on the second. But it was reported in The Himalayan Times last week that the majority of those climbers didn’t reach the main summit at all, but one of the two foresummits. So what happened and why? In this post I try to shed a little light on the mystery, and discuss some of its wider implications. At its heart was an unexpected problem with the rope fixing. The Nepali operator Seven Summits Treks was by far the biggest operator on the mountain this year in terms of number of clients and climbing Sherpas. They were tasked with fixing ropes all the way to the summit. But for one reason or another they didn’t do this, and fixed the ropes only to the foresummits instead. The summit of Manaslu has long been a subject of confusion, and I wrote an entire post about it a few years ago. The summit crown contains three summits, the first a rounded snow dome, the second a slightly narrower snow dome, and the third being the main summit itself. The main summit is very small, with space for only two people. To get there you have to pass the two fore-summits and follow an exposed snake-like ridge. Here’s a photo I took of my teammate Anne-Mari Hyrylainen heading to the summit in 2011. You can clearly see the main summit right at the back, the second foresummit in front of it, and the first foresummit rising off camera to the right of the photo. You can see that Anne-Mari is practically tripping over the fixed rope at her feet. This line of cord runs all the way up the ridge at the back of the photo, and you can see footprints on the ridge. Anne-Mari is attached to this rope by means of a carabiner and length of prusik cord tied to her harness. It provides security for her when she ascends the ridge at the back. 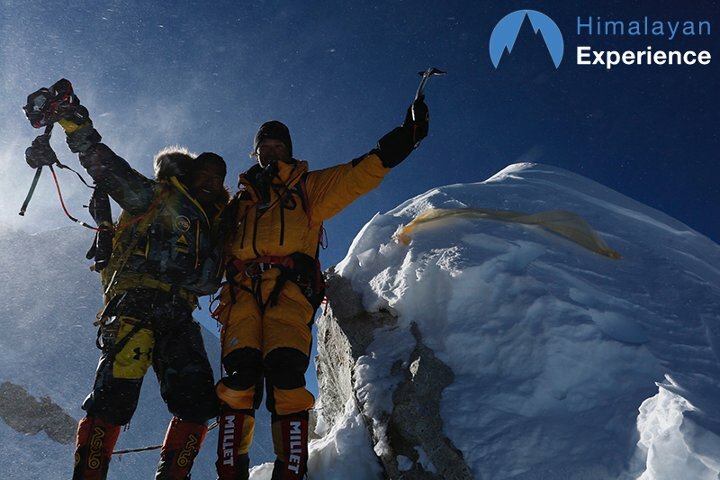 In 2011 (and all years from 2008 to 2014) the rope fixing was done by the Sherpas from Himex, who were always the largest team on the mountain. Himex is owned by Russell Brice, who was kind enough to answer my questions about how the rope fixing was completed, and how the contract for rope fixing is agreed. Here is a detail from the photo zoomed in. Russell explained that the bottom end of the last fixed rope was attached to the big rock halfway up the ridge (no. 1 in the photo), while the top end of the rope is where you see the prayer flags (no. 2). This is where we stopped in 2011 and took our summit photos. In fact there were an extra two metres of mountain behind us, as you can see in this photo of Chongba, whom I climbed with, doing his Winston Churchill impression on the summit. It didn’t occur to any of us to climb those final two metres. For one thing the fixed ropes had ended, and secondly they looked like a giant cornice that would collapse as soon as anyone stood on it. It looked suicidal, and as far as any of us were concerned we had reached the summit. It didn’t seem necessary to climb those final two metres, especially in the absence of a rope. However, when my partner Edita reached the summit after the avalanche in 2012, there was a little more snow, and somebody had fixed the line up those final two metres. Here she is holding up her Lithuanian flag. She also took a photo looking back down the ridge, which shows things a little more clearly. The two figures in blue are standing in roughly the spot where we took our summit photos the previous year. The reason I’m showing you these things is to illustrate a point about summit photos. In the Himalayan Times article, an official from Nepal’s Ministry of Tourism is quoted as saying it’s a difficult task to verify the claims of whether climbers made it to 8163m. In fact it’s easier than he thinks. With even just a handful of photos, you can go some way to working out where a particular photo was taken from. With 150 summit photos submitted by all of this year’s summiteers, it should be even easier. I’m going to scratch the surface in this post, and leave some unanswered questions. I contacted many of the people here to ask them where their photos were taken from. Hardly any of them responded, but I don’t read anything into this, and nor do I blame them for it. As someone who works full time and writes in evenings and on weekends, I know that it’s simply not practical to reply to every random stranger who contacts you asking for information. I am reproducing these photos under fair use, to illustrate an important principle, but I should point out that I’m not trying to shame or undermine anyone. I have posted several to show that I am not singling out any particular operator or individual, but making a general point. Having struggled to the top myself, I have the utmost respect for anyone who climbs Manaslu, whatever summit they reach. I also sympathise with them, and feel they were let down by the rope fixing team. It was a wise decision to stop where they did. I know how exposed the final ridge is, and I’m pretty sure I would have done exactly the same thing in their place. For what it’s worth, I have also just admitted that I myself stopped two metres short for much the same reason. I will start with some other photos as a reference point. The above photo is Toshio Imanishi’s picture of the very summit in 1956. It was taken from roughly the big rock on the summit ridge that Himex attached the fixed rope to in 2011, looking south. As you can see, there was far less snow then, but one thing that hasn’t changed are the peaks on the skyline behind. Any summit photos with these peaks in them was taken facing south. Contrast it with this one of Chedar Sherpa. This was taken by my teammate Karel in 2011, from the point where we all took our summit photos. He is looking north, and you can see some of us climbing the summit ridge behind Chedar. I am actually the first of the three figures in yellow. There is a distinctive dome-shaped peak close to the horizon above Chedar’s head. I’m not sure, but I think it might be Kangguru, or Himlung, a couple of 7000m peaks close to the Tibetan border. This peak appears in several of this year’s summit photos, and is an indication that the photographer was looking north. My third reference point is a photo from this year. 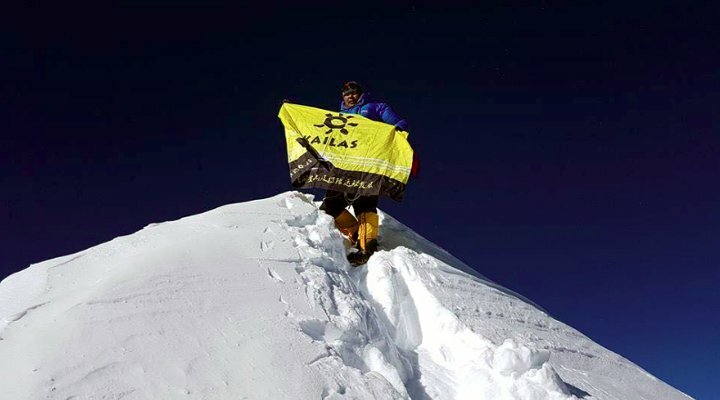 This is a photo of Manaslu’s summit crown, taken by the rope fixing team of Seven Summits Treks, and posted on their public Facebook page. You can actually see people on their way up the summit ridge, including one figure almost at the summit, proof that not everyone this year stopped at one of the foresummits. You can also see a distinctive notch of rock on the left hand side of the second foresummit. This notch clearly identifies many summit photos that were taken on the second foresummit, including this one, posted on the Himex website. Meanwhile, Seven Summits Treks posted this one of one of their clients on what looks to be the gentle snow dome of the first foresummit. One person who undoubtedly did go beyond the foresummits was the Canadian Christopher Manning, who posted the photo below on his public Facebook page. You can even see people taking summit photos on one of the foresummits behind him. The angle of the second foresummit suggests it may have been taken a little lower down the ridge from the place where Karel took his photo of Chedar in 2011, but very close. Because it was taken facing north it’s not possible to say for certain how far up the summit ridge he is, but there is a distinctive rock on the left that should be identifiable from other photos. I believe it may be the big rock on the summit ridge that Himex tied the lower end of the rope to, or perhaps the black rock triangle in Seven Summits’ photo of the summit crown. Of course, I could be wrong and he may have other photos that provide more clarity. The Italian endurance athlete Danilo Callegari posted this fantastic photo of himself standing on one of the summits, and from the evidence of Christopher Manning’s photo, it appears to be the second foresummit. More evidence is revealed in this video posted on YouTube by the Swedish climber Carina Ahlqvist. I believe this was shot from almost the same spot as Christopher Manning’s photo. As the camera pans from left to right you can see what looks to be the same distinctive rock to the left, and the distinctive dome-shaped peak on the northern horizon. 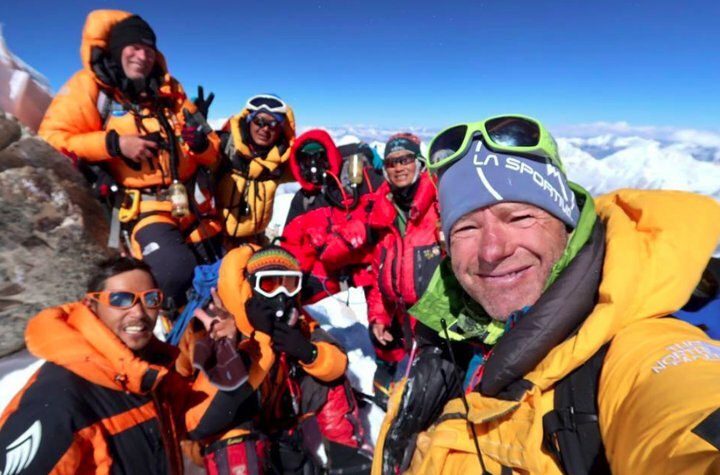 My final example is this summit selfie posted by Willie Benegas of Benegas Brothers. There are just too many people in it to have been taken right on the tiny main summit, but I’m sure that a respectable operator like the Benegas Brothers would be happy to provide an answer to the right person (they didn’t reply to me). Does it matter which summit anyone reached? At the end of the day, does it matter which summit anyone stood on? When Joe Brown and George Band made the first ascent of Kangchenjunga in 1955, they deliberately stopped just below the summit at the request of the local people, who believed the very summit was the abode of mountain gods. Nobody has ever questioned their ascent. 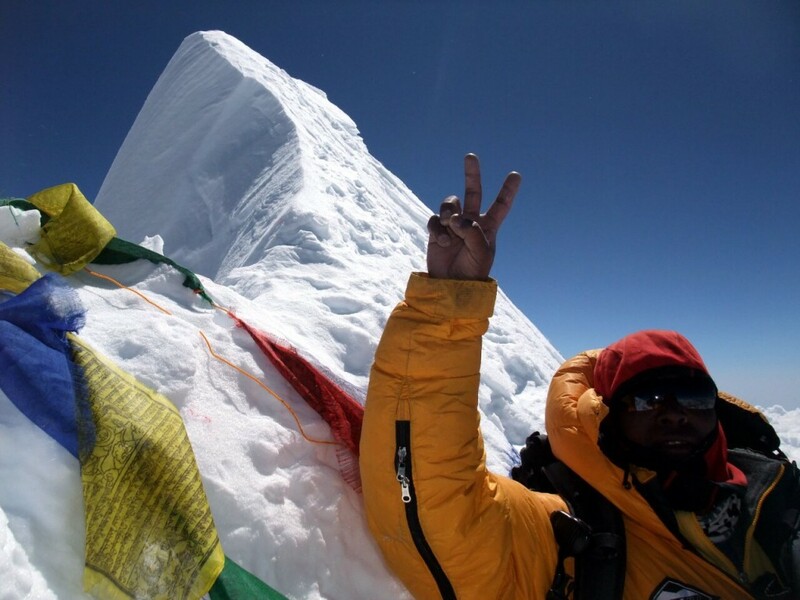 When I reached the summit of Cholatse in Nepal in 2014 I posted a slightly unusual summit photo, which featured somebody trying to get up a 5m cornice behind me. There was no way I was ever going to try and get up that cornice myself, and as far I was concerned I had reached the summit. On the other hand many people will look at that photo and tell me that the evidence is clear: I didn’t actually reach the summit, the very highest point on the mountain. That’s OK too; I can accept that other people may have that point of view, and I can understand it. And then there’s Mera Peak, a popular trekking peak in the Solu-Khumbu region of Nepal. Operators have been taking their clients to its second highest summit for years without telling them they’re not going to the highest point, and no one seems to care. It’s more of an issue for people who are claiming records. 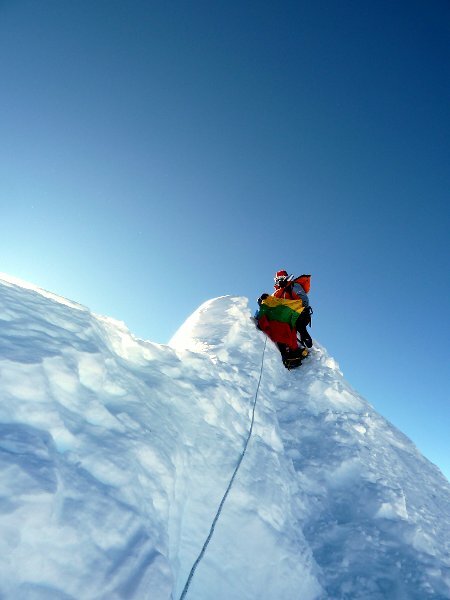 For example, in her summit video Carina Ahlqvist tells us she is the first Swedish woman to climb Manaslu. Her ascent may well be scrutinised in much greater depth by the second Swedish woman to get there. In any case, she is also one of many, and she can still be proud of her achievement. People who are trying to bag all fourteen 8000ers are more particular about which point they reach. 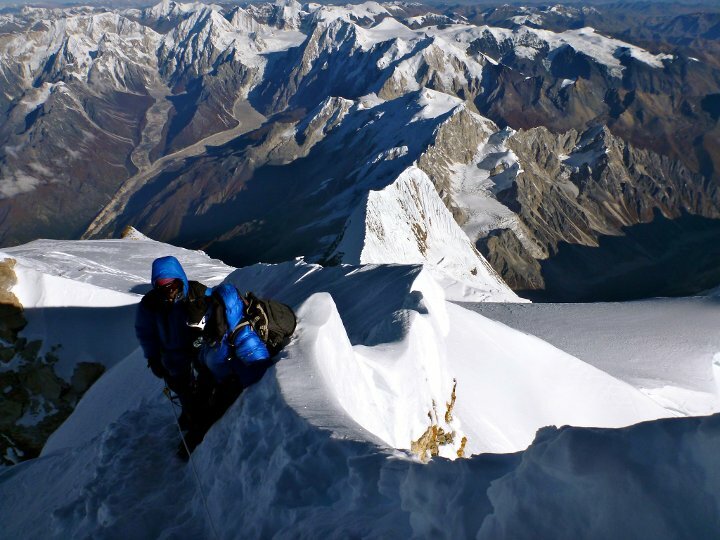 Several of the peaks, including Shishapangma, Broad Peak and Cho Oyu, have foresummits that are more easily accessible. For everyone else it doesn’t matter so much. 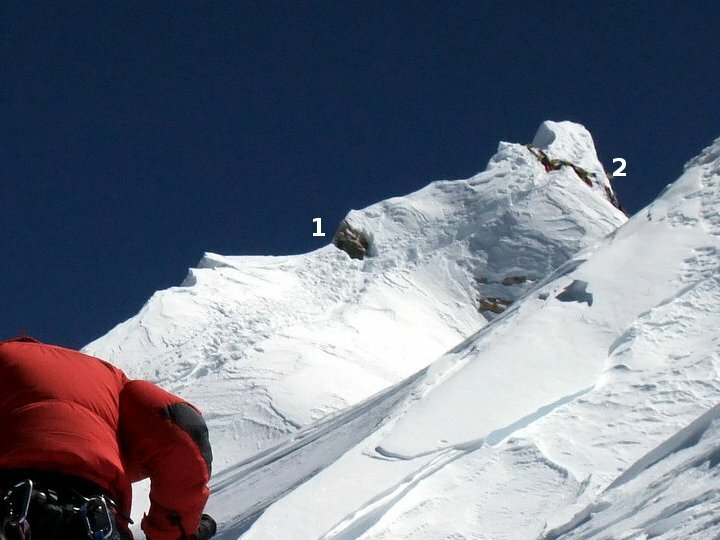 More tragically it mattered enough to one Japanese climber, who was so keen to reach the true summit on 7 October this year, even without the fixed rope in place, that he fell to his death trying to get his summit photo. It’s not clear how much scrutiny of summit photographs will be done by Nepal’s Ministry of Tourism, but I believe they will issue the summit certificates anyway, even to those who stopped on one of the foresummits. I also contacted the team from the Himalayan Database, custodians of the archive of Himalayan chronicler Elizabeth Hawley, to ask them for their views. Richard Salisbury told me they distinguish between the foresummits and the main summit, based on consensus among climbers and operators who have been there. He provided the following definition. 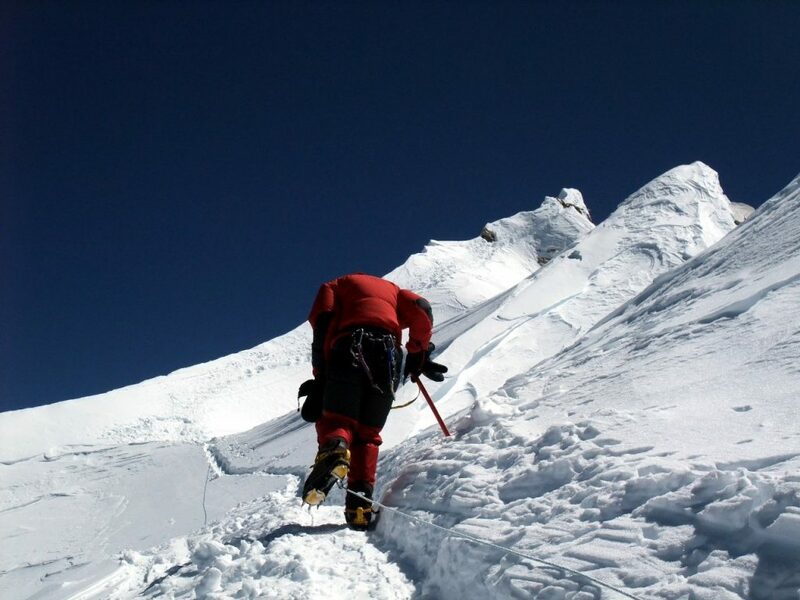 We grant success if they get to the very top or within a few meters of the top, and fore-summit success if they get only to the lower fore-summits (about 8125m). I hope that the majority of the 150 people who climbed Manaslu this year will make the jobs easier for Elizabeth Hawley’s team by being honest and open about which point they reached, for the benefit of everyone. How about the rope fixing? While summits and foresummits matter to some people, others will be more concerned about the rope fixing. This is perhaps the real controversy of Manaslu this year, given that it deprived most of this year’s climbers of the main summit. Had the rope fixing been completed as it had in previous years, then we wouldn’t be discussing what is a summit and what isn’t. Russell Brice explained to me that the rope fixing is usually done by cooperation between the various teams, with one team taking the responsibility to organise equipment and manpower. Each team pays a rope fixing fee to the Expedition Operators Association (EOA) and those teams who also supply gear and manpower are reimbursed by the EOA for what they supply. For the past few years Himex has been the team doing the organising, operating and the bulk of the work in fixing on Manaslu, with some assistance from other teams such as Altitude Junkies. 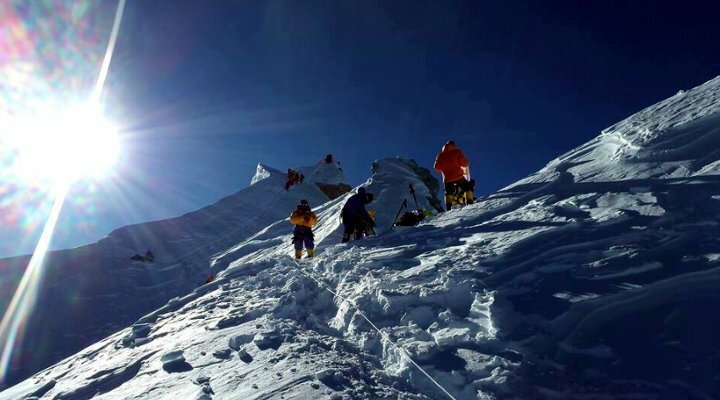 This year the EOA decided to give the rope fixing contract to the Nepali operator Seven Summits Treks, as they were by far the biggest team on the mountain. It’s not clear why Seven Summits Treks didn’t put ropes in all the way up the summit ridge, as Himex had in previous years, but it had consequences not just for their own clients, but everyone on the mountain. 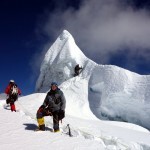 Seven Summit Treks has been steadily gaining market share on the 8000m peaks in recent years. In theory this is a good thing. Western operators have been competing on luxury over the last few years. This has driven up prices and made trips unaffordable to many people. The appearance of reliable Nepali operators in the market is potentially beneficial, not just for Nepal, but for western climbers who need a cheaper option. But you get what you pay for. Unfortunately some people paid rather more for their expeditions, but they were all let down equally by one budget operator’s failure to complete the task they had been set. In the ideal scenario the appearance of a cheap Nepali operator taking business from established western operators should cause the western operators to examine their prices and find ways of providing their clients with better value for money. I discussed this in a previous post, but it needs to work both ways. The cheaper Nepali operators also need to try and raise their standards up to that of the western operators, or the only consequence will be to drag everyone down. It appears that all of the operators on Manaslu this year ended up letting their clients down because of the actions of one. I can’t imagine Seven Summits Treks were very popular, and it seems that the summit ropes were not the only mistake they made. 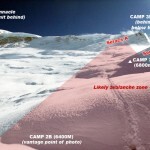 When I climbed Manaslu in 2011 we climbed up a great big snow slope between Camps 2 and 3. This slope was swept by an enormous avalanche in 2012, killing 11 people. The following year the route was moved to a safer but more difficult line to the right, which isn’t threatened by the seracs which caused the avalanche in 2012. But this year Seven Summits Treks fixed the ropes straight up the snow slope again, against the wishes of other operators more concerned about the safety of their clients. There were also reports that inferior quality ladders were used to span the crevasses between Camps 1 and 2. This story is set to continue. The Chinese government recently raised permit fees for Cho Oyu and Shishapangma, across the border in Tibet. 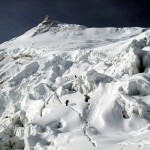 This could make Manaslu more popular, causing more congestion on that tiny summit. 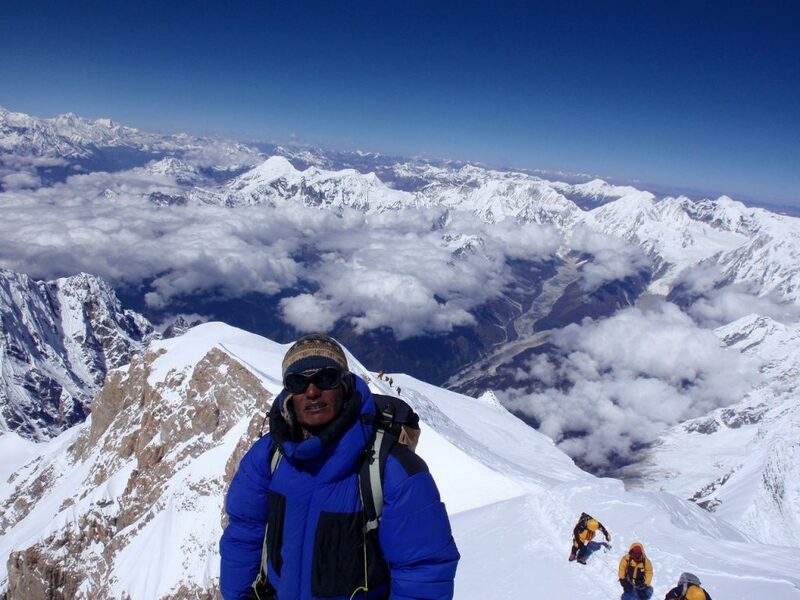 I really enjoyed my expedition to Manaslu and was lucky to climb it when I did, but there are other mountains. “And before our teams left C4 to go to the summit we asked if they had fixed rope to the main summit and they told us that they had…so we never took any extra rope. But in fact they had not fixed to the main summit. They fixed to the final ridge…but not the main summit. Thanks, Alan. 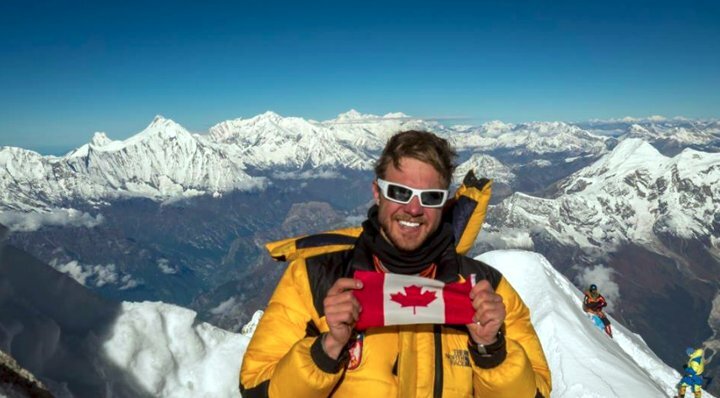 It must be hard for Russell having done so much over the years to make Manaslu a better experience for all teams, to find he’s no longer able to fix the route adequately for his own. Judging by the latest edition of the Daily Moraine, Seven Summits Treks weren’t his only gripe this year though! For a climber’s personal experience, I am sure, last “few” meters wouldn’t matter a lot. But for a certificate [from a historian, not the ministry], they do. P.S. I usually find myself silently but eagerly waiting for your next blog post. Just thought to share this, as I am not so good at commenting. Hello there, am a novice mountain enthusiast. Enriching myself with these Debates & Dialogues….and eagerly waiting for the nest issues of your write-ups. Thanks so so much.